Property Location With a stay at Seneca Niagara Resort and Casino in Niagara Falls, you&apos;ll be minutes from Niagara Aerospace Museum and Daredevil Museum of Niagara Falls. 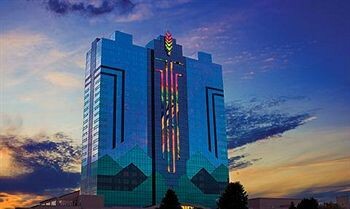 This casino hotel is close to American Falls and Niagara Falls State Park.Rooms Make yourself at home in one of the 604 guestrooms featuring minibars. Complimentary wireless Internet access is available to keep you connected. Bathrooms have showers and hair dryers. Conveniences include phones, as well as coffee/tea makers and irons/ironing boards.Rec, Spa, Premium Amenities Relax at the full-service spa, where you can enjoy massages, body treatments, and facials. Gambling sorts can try their luck at the casino, while others may prefer a health club or an indoor pool. This hotel also features complimentary wireless Internet access, an arcade/game room, and a hair salon.Dining Grab a bite at one of the hotel&apos;s 10 restaurants, or stay in and take advantage of 24-hour room service.Business, Other Amenities Featured amenities include a business center, express check-out, and complimentary newspapers in the lobby. Event facilities at this hotel consist of a conference center and conference space. Free valet parking is available onsite.